It’s a group kata exercise that involves all members of the class working with each other. First you will need to choose a particular bunkai / application for the exercise. To keep it simple, you might start with the first move from a Pinan / Heian kata, for example. Simply make a line, and put one person at the front facing the group. Let’s call this person the “Defender”. Everybody else is an “Attacker”. 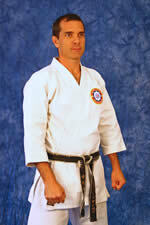 Have the first person in the line attack the Defender, who will apply the bunkai for that part of the kata. Once the Defender completes their application, the Attacker goes to the end of the line. Now the second person in line attacks the Defender and the process repeats. Once all members of the line have attacked once, the Defender then goes to the end of the line and the first Attacker now becomes the Defender. This kind of exercise is something that is fairly common for practicing kumite or basics, but recently I started having my students do this to help them understand their bunkai and practice against different opponents of differing strengths, heights and speed. Furthermore students learn to understand that in order to do bunkai realistically, they don’t have to be “facing the front” and have their partner attack from their left, as in the first move of Pinan katas. Remember application should be practiced where the attacker is immediately in front of you, using BOTH sides of the body AS WELL AS in the context of the kata where a turn to the left might precede the application (or might be part of the application itself depending on your interpretation). Think about a realistic situation where an attack might come from directly in front. If your students have only ever applied bunkai by turning to their left first, they’ll find applying the bunkai “straight on” to be somewhat challenging. Many will by default step FORWARD in cat/back stance to make the application, when really they should step BACK into cat/back stance and then apply their defense, as per the kata. For many students there’s often a disconnect between the techniques of the kata they “perform” and the self defense techniques where they must “apply”. This kind of exercise helps bridge that gap. P.S. If you liked this exercise and you’d like more exercises and ideas for teaching class, please take a look at my karate drills and exercises here. I have a ton of them for kumite, kata and kihon that will keep your classes fresh, your students engaged and working hard.